If you asked for my opinion whether to develop an application using (unmanaged) C++, I would strongly advise you to reconsider. Unless you deal with real time applications (or near real time applications), you should better utilize the managed world. Sure, there are times for old good C++; especially when the application's memory footprint is an issue, but needless to say, you have better chances in productivity, ease of development and maintainability in the managed applications (C#, Java and etc...) than in the unmanaged world. Sometimes, obviously, the above advice is impractical. When dealing with complex algorithmic issues, which already have pretty sound support in various unmanaged C++ toolkits and frameworks, you are forced to choose what exists over reinventing the wheel. C++/CLI can bridge the gap. The common practice is to wrap the unmanaged libraries with the C++/CLI, thus exposing the unmanaged functionality through the managed C++ layer. 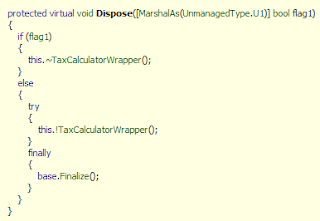 In the example below, Taxes project contains various algorithms for tax calculations written in (unmanaged) C++. The Taxes project is wrapped with TaxesMixed project which is a C++/CLI project. 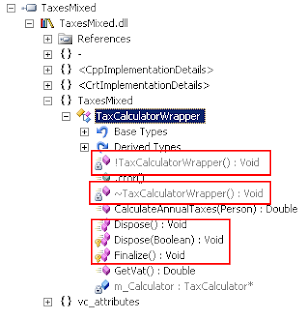 Finally, TaxesApp project, which is written in C#, uses the TaxesMixed wrapper to utilize the complex unmanaged tax calculations. If you want to debug the unmanaged code (e.g.Taxes above) from the managed (e.g. TaxesApp above), don't forget to mark the option enable unmanaged code debugging on the debug tab of the managed project's settings. C++/CLI classes that use unmanaged C++ classes should implement Dispose\Finalize pattern (look for: "Deterministic finalization template" title). Apparently, implementing the pattern is much easier using C++/CLI than C#. All you need, is to provide a deterministic destructor (~ syntax) and a finalize method (! syntax) and everything else will be generated by the C++/CLI. C++/CLI will generate all the additional Dispose, Dispose(bool) and Finalize methods in order to complete the pattern. Here is a quick peek into the Dispose(bool) method, using Reflector. As you can see, the method calls the deterministic Dispose method (~) when the TaxWrapper.Dispose() method is called and calls the Finalize method (!) when the TaxWrapper is garbage collected. Managed objects (on CLR Small Object Heap) don't remain at the same location for their lifetime as they are moved during the GC heap compaction cycles. As a consequence,a native pointer that points to a CLI object becomes garbage once the object has been relocated. In order to ensure a correct behavior, C++/CLI introduces a pin_ptr pointer which pins a CLI object in order to prevent its relocation while a garbage collection cycle occurs. //Passing the object or one of its value members to a native code. //Pinning an array (by pinning the first element). Pinning a sub-object defined in a managed object has the effect of pinning the entire object. Pinning an object also pins its value fields (that is, fields of primitive or value type). However, fields declared by tracking handle are not pinned. A pinning pointer can point to a reference handle, value type or boxed type handle, member of a managed type or to an element of a managed array. It cannot point to a reference type. In any case, if you are interested in reading more about C++/CLI, you can find here very good tutorials on the topic.